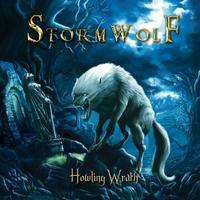 We continue to tour the globe and stop this time in Italy to check the new album "Howling Wrath" from the band STORMWOLF released by Red Cat Records in March 2018, with a beautiful art for the cover and eleven tracks led by singer Elena Ventura. Considering the particular tastes of this copywriter who writes for you at this time I must admit how much I am demanding about the lines of female vocals, I think no news for those who accompany my reviews, the demand becomes greater when the style adopted is the traditional heavy metal , or, bordering the lines of the 80's, and I must confess that I love this revival of the most traditionalist metal but as a collector of albums for many years and almost "retired" musician it is always difficult to know where the parameters were lost or when things become repetitive. When I picked up this interesting album for art, I immediately put it without paying any attention to the members or even less about the details about the band, I think it was always the best way to open a band work that is not part of my usual catalog, and the first track "The Phoenix" brings a fluid introduction with dark winds and a battle-fit for the guitars that are accompanied expressively by the sumptuous lines of Tiziana's drums, for a few seconds everything sounds as known as much of what I've heard before but It is a pleasant way, it is from the entrance of Elena's voice that things get complicated, although it has a powerful voice and sharp sharpness, I feel in this range the same shift I have observed in many bands of the sector for many years, the instrumental seems far from lead vocal (perhaps an alternative adopted to highlight) and this puts each note and timbre in evidence and with it all repetitive errors. Even sounding pretty feminine some nuances are too much that ends up taking some of the brightness of the instrument. So a little disappointing for an album start, as I always say "Everything that is exaggerated becomes tiring ". "Winter of the Wolf" in turn saves by the well-composed net and engaging riffs that overlap on icy choruses and a throbbing bass dynamic. And finally it is more pleasant to get to "Marathon" that brings some doses of blues rock where Elena's vocals fit with more dignity. But I continue to hate this elevation of pitch for the vocal which makes all the instrumentation in the background. "Fear of the Past" follows the same tracks from the previous tracks with nothing to impress, and I'm really sorry for that, I'd love to hear the embarrassed drum webbing and bass in a sharper way, this could have condensed the unnecessary heights too much. At times like the first minutes of "Lightcrusher" everything finally fits and jumps from a traditional Heavy to a more modern line and probably this is the best track so far, I love it when the tones become more subtle and we can pay more attention Tiziana's exceptional drumming lines wrapped in the visceral waves of bassist Francesco, and I can say that they are the balance points of this album. And for the rest of my ears we get the magnificent instrumental session in "Thasaidon" and here I can say that this band shines even wanting to sound traditional this is the exact point where they gain personality and considering the entry of "Soulblighter" then I have the sensation that finally the album started, forgive me the band, but I love that Elena is a tone down and when the backing of Davide comes on the scene then we have a more fervent weight. The guitars still sound very technical and almost without feeling but for such a new band still exists a long way. I'm very sorry that the aesthetic adopted gets lost when Warlock's "All We Are" version comes on the scene, honestly 3:10 lost in a full-length. The same mistake goes back to LIZZY BORDEN's version of "Me Against the World," but it sounds much better, closing with a bit of nostalgia for this album. In general I would not totally condemn this album, as I said the drums and bass sounds dignified and the guitars have quality although a lot of technique is applied, unfortunately sometimes I miss a better fit to vocalists like Elena. I remember the same problem when the Brazilian band FIRE STRIKE released the EP "Lion and Tiger" in 2013, Aline had a powerful voice but when ill-suited to the context sounds abrupt and uneven. I always recommend bands harmony and a personality of their own, even if inspiration are the great names of the past. Highlight for "One False Move".